A comforting and warming soup that’s easy and simple to make and loaded with flavor! If you are looking for a soup recipe that is hearty, will fill you up and keep you warm, then this is it! 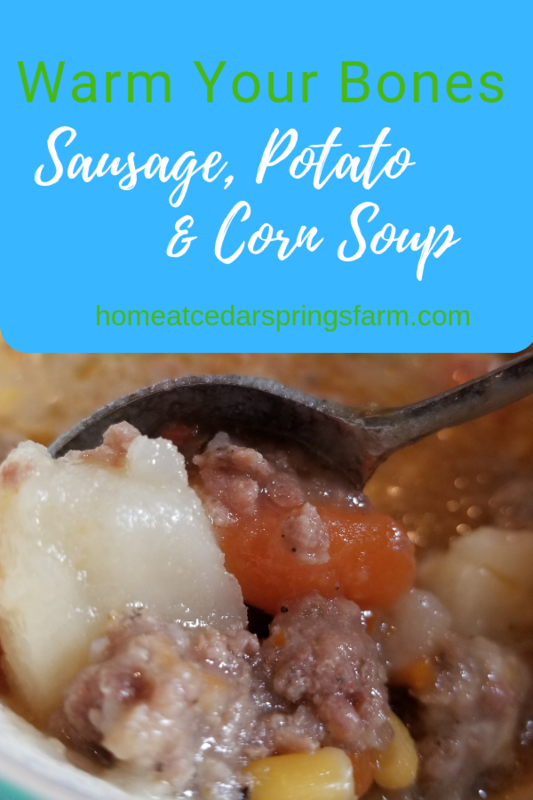 Stovetop Sausage, Potato, and Corn Soup has chunks of sausage, potatoes, corn, and carrots and will have your belly full and your taste buds thanking you. There’s just something about a bowl of soup that calms the soul on a cold winter day. 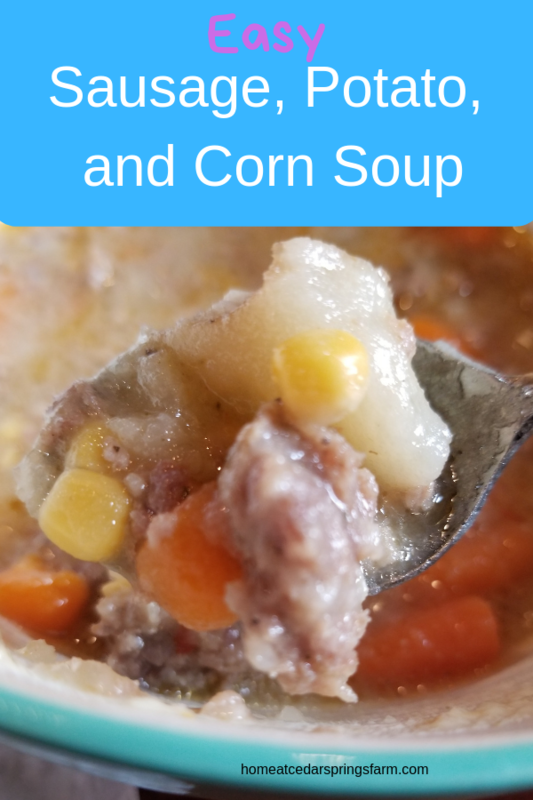 This Sausage, Potato, and Corn Soup is creamy and loaded with vegetables. It certainly fits the bill for being filling and family friendly. I am so thankful my family loves soup during the winter. Soups are easy to pull together, prep, and cook. Once you get everything in the pot, the stove does the rest of the work for you. This Soup Will Have You Wishing For Winter All Year Long! Well…maybe not winter..but you can have this soup year round, anyway! This is one of those soups you are going to want to make over and over again. It will make you wish for cold weather all year long so that you can enjoy a nice big bowl of this chunky and delicious soup. To make this soup even easier to prepare, I used natural cut fries and frozen baby carrots. I just pulled them out of the freezer, cut them in half, and threw them in the pot. It can’t get any easier than that! Fix this soup and cozy up on the couch with a good movie and enjoy these winter days. In a large stock pot, brown sausage, and onion. Drain. To the pot, add potatoes, carrots, corn, broth, water, garlic powder, and red pepper. Bring to a boil then reduce heat and simmer 30-45 minutes or until vegetables are tender. Mix together milk and corn starch and slowly pour into the soup. Stir well. Simmer for 5 more minutes. Be sure to try my Taco Soup, Beef Stew, or Vegetable Beef and Sausage Soup. 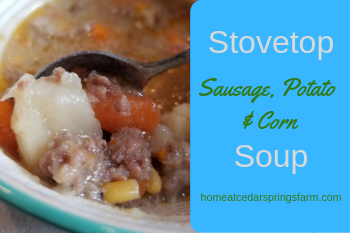 Chunks of sausage, potatoes, corn, and carrots will have your belly full and your taste buds thanking you. In a large stock pot, brown sausage and onion. Drain. To the pot, add potatoes, carrots, corn, broth, water, garlic powder, and red pepper. Bring to a boil then reduce heat and simmer 30-45 minutes or until vegetables are tender. Top with cheddar cheese. Serve with cornbread. Know what I’m adding to the menu plan! Yum! This looks great. Thanks! It is very good! Hope you enjoy!